Burning wood crackled in the dark hut lit only by the fire in the middle of the adjacent room. The home of the medicine man was much like the other Hmong homes we had come across in the village, only larger and with a display of photographs of some relative or other from the city: clearly a symbol of wealth and the higher status the medicine man held within the community. Dogs barked outside in the sunlight, a stream of which gushed in every time one of the children poked their head from behind the curtained door to sneak a giggly peek at the ‘strange people’ invading their home. The fire continued to crackle; spitting out embers onto the mud floor. Eventually he returned. Pulling up a plastic chair he took Andrew’s hand in his and began to examine it. Our guide, Xu, explained the situation in their local dialect acting as a translator between the two men. Whilst they discussed the symptoms of Andrew’s eczema, I became aware of the lack of a female figure in the house, presuming she would be tending to something over the fire in the kitchen. As I was learning, in modern Hmong society it is the woman that goes out to work; farming, trekking with tourists or selling handicrafts in the nearby town of Sapa, while the man stays at home. A small eye locked with mine from behind the curtain and a cheeky tongue poked out; more giggling followed and I struggled to stifle a grin. “He will deliver the medicine to my house.” Xu declared as we got up, piled the plastic chairs back up on one another and left, thanking the medicine man for his interest and kindness. It was our second day in the mountain village of Ta Van near Sapa. Having trekked from the town through the mountains with Xu the previous day she had asked if we wanted to stay at her homestay that first night. On realising the state of Andrew’s eczema, worsened by the incredible heat during the trek, she had insisted on trying to heal him and said she could take us to see the local medicine man the following morning if we did so. The decision was made and was to be by far the best decision made all trip. Apologetic as to the fact there would be another family staying, Xu showed us her humble home from the opposite mountain side. 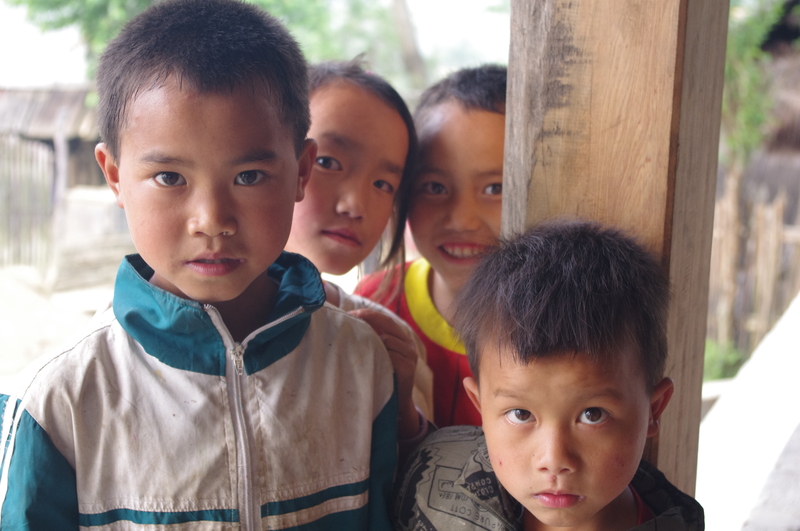 As the only house in the tiny Hmong village to have a water tank, it was easy to spot and was an ever nearing beacon of hope as we dragged our weary legs up the last hill of the day. “I have a shower…with hot water!” Xu boasted, and what a treat it was, having been fully prepared for 3 days of no washing; sweating like a brewer’s horse. Freshly showered and changed, we settled down in the verandah area looking out over rice fields and the mountains ahead. Andrew opened a couple of beers. It was perfection. By now Xu was working like crazy in the kitchen, as if a 9km hike to town to meet us this morning followed by a 17km hike in the mountains with us wasn’t enough for one day! “Do you mind if we join you?” Although from Belgium, the mother of the other family explained that she was originally from Vietnam. In the early 1970s she, as a child, and her family were forced to leave their home in Hanoi under the Viet Cong regime since her mother was Pakistani by origin. They managed to make it to a refugee camp in Thailand where they lived for 5 years; her father and brother separated from her, her mother and sisters as the men and women were to live in different halls – men upstairs and the women downstairs. Eventually in 1979 they were granted asylum in Belgium. Boarding a plane for the first time, the family were reunited knowing nothing of this country which was soon to become their home. On arrival they were housed in one room where they lived for 6 years while they worked, went to school and learnt the language before making it on their own. “They are so poor; the mountain people, so poor.” She informed us, referring to the various tribes who live in the Northern Vietnamese mountains. Her voice was almost shrouded with an element of guilt; guilt that despite her trying start in life, she was one of them and by comparison her life was full of such richness. As the evening continued however, I often found myself contemplating whether the richness of life these people had far outweighed the ‘richness’ of modern western society. As well as the amazing insight Kim brought to the evening, being able to translate some of the more complex issues facing Hmong women, she also brought sweets…bags full! This latter gift led to a constant swarm of local children all of whom were covered in dirt, half dressed, grinning from ear to ear and absolutely adorable. It was difficult to make out which of these children were actually Xu’s and even when we sat down to a feast of the most delicious Vietnamese meal (bamboo, cabbage, wild mountain mushrooms, chicken, pork and rice) it turned out that of the 4 children at the table only 1 was hers. An unforgettable evening of drinking beer and eating with the family continued with 2 more of Xu’s children returning home and reluctantly (at first) singing and dancing for us until it all ended in a fit of hysterics. It was at that moment I took a step outside of myself and decided to capture this moment in my mind forever. After dinner, which we all helped to clear away, the high levels of sugar seemed to have finally hit the children. Lin, Xu’s second youngest, was by far the liveliest character and decided it would be a brilliant idea to zip himself up in a plastic bag, used for storing blankets, and begin hopping around. Being lucky enough to have a concrete verandah, Xu is deemed as quite rich in the village, but such luxury soon had it’s downfalls when Lin missed a step and landed face first onto the concrete floor. The noise was dreadful. A desperate bid to free him of the zipped up bag began, whilst his elder sister was getting into trouble for encouraging him, whilst Kim was telling Xu it wasn’t the sister’s fault, until we eventually managed to retrieve Lin and sit him down with a can of coke over the lump on his head.